(Nanowerk News) The resolution of scanning tunnelling microscopes can be improved dramatically by attaching small molecules or atoms to their tip. The resulting images were the first to show the geometric structure of molecules and have generated a lot of interest among scientists over the last few years. Scientists from Forschungszentrum Jülich and the Academy of Sciences of the Czech Republic in Prague have now used computer simulations to gain deeper insights into the physics of these new imaging techniques. One of these techniques was presented in the journal Science by American scientists this spring. The results have now been published in the journal Physical Review Letters ("Origin of High-Resolution IETS-STM Images of Organic Molecules with Functionalized Tips"). Molecule (green) between STM tip (yellow) and substrate (grey). "A comparison between the experimental results and our simulations shows excellent agreement and that, therefore, our theoretical model is able to explain the mechanism behind the microscopic images in this family of techniques," says Prof. Tautz from Forschungszentrum Jülich. "This comparison is essential for analysing the images." Together with his colleagues from the Peter Grünberg Institute (PGI-3), in 2008 Tautz introduced the method of attaching single molecules – initially hydrogen molecules, later molecules such as carbon monoxide – to the tip of a scanning tunnelling microscope and using them as extremely sensitive measuring probes. The scientific community responded with great interest to this method, and the technique has since been continuously refined. It enables scanning tunnelling microscopes to be used as a kind of atomic force microscope that is able to image the geometric structure of molecules with unprecedented accuracy. "The valence charge clouds of complex organic molecules often spread over the entire molecule, thus concealing its atomic structure," says Tautz. 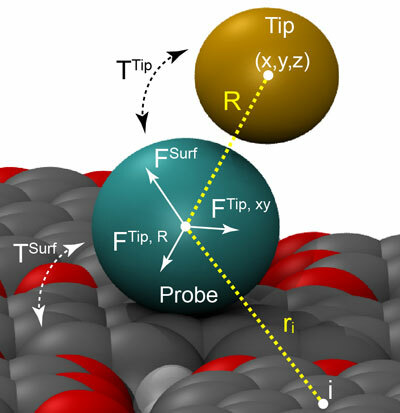 Flexibly bound molecules at the microscope tip can be utilized as tailor-made sensors and signal transducers that are able to make the atomic structure visible nevertheless. Simulations of different types of scanning probe microscopy with atomic-scale sensors: Left: Simulated atomic force microscopy image In this method, the tip of the microscope scans the surface of the sample (here: a single cobalt phthalocyanine (CoPC) molecule), measuring the force gradient, i.e. the change of force with distance between tip and sample. Centre: Simulated scanning tunnelling microscopy image In this method, the tip of the microscope scans the surface of the sample (here: a single cobalt phthalocyanine (CoPC) molecule), recording the resulting tunneling current between tip and sample surface. Right: Simulation of an inelastic electron tunnelling spectroscopy image In this method, the tip of the microscope scans the surface of the sample (here: a single cobalt phthalocyanine (CoPC) molecule), detecting shifts in the vibrational frequency of the sensor particle oscillating against the tip. In the last few years, such atomic sensors have also proven useful for work with atomic force microscopes. Then, in May 2014, scientists from the University of California, Irvine, showed for the first time that these sensors can also be used to improve signals in a related imaging mode known as inelastic electron tunnelling spectroscopy. In this case, it is the vibration of the sensor molecule against the microscope tip that reacts sensitively to the surface potential of the scanned sample. "Our calculations show the effect of the electrostatic forces on the high-resolution AFM, STM, and IETS images", explains Dr. Pavel Jelínek from the Institute of Physics at the Academy of Sciences of the Czech Republic in Prague. "We believe that the results of this work are an important contribution to the use of inelastic electron tunnelling spectroscopy that will allow the technique to be used as an additional source of information in materials science and to derive additional parameters from the images."